As busy moms to be we can get so caught up in buying things for the baby on the way that we forget to take care of ourselves. These 7 pregnancy must haves will help ensure you take care of yourself while you do all the hard work of growing a life! 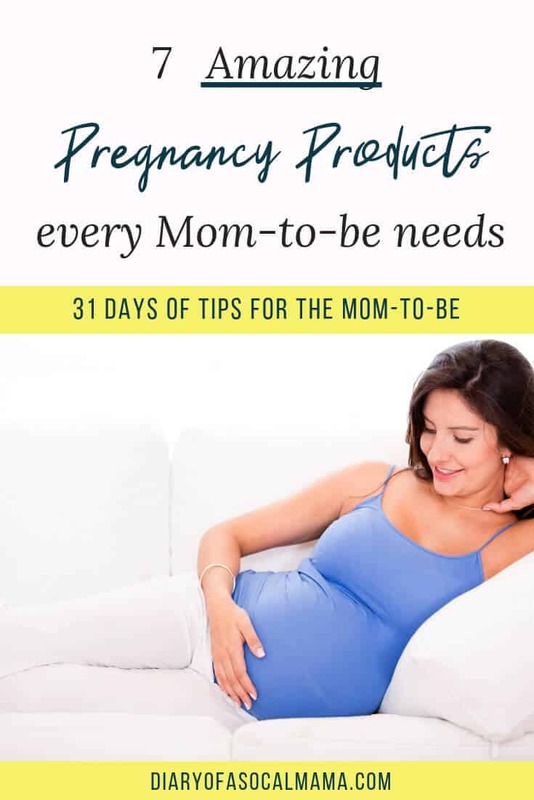 This list of amazing pregnancy products was curated from my own favorites and the top products I’ve seen suggested by the women in my mom groups. This is post 8 in the 31 days of tips for moms to be series. You may be able to stretch your regular clothes for a while, or borrow items from your husband, but you will be uncomfortable enough without trying to squeeze yourself into clothes that no longer fit. Do yourself a favor and get some good, comfortable pieces that will last you throughout your pregnancy. Two of my favorite places to shop are Motherhood Maternity and Old Navy (their maternity clothes are available online only). Second-hand baby stores often carry gently used maternity clothes as well so that can be a great place to stock up without breaking the bank. Don’t forget about the undergarments when you’re shopping for maternity clothes. You’ll likely need to ditch the thongs and tight underwear sooner than you think. They make great maternity underwear that sit under your belly so that they aren’t tight and constricting. These Intimate Portal maternity underwear from Amazon were a top pick in my mom group. The lacy edging helps them to still feel cute even being maternity underwear. I was never a big fan of the pregnancy pillow my first pregnancy, but I’m definitely considering trying it again. Most moms I know swear by them. They also report their husbands and four-legged friends regularly try to steal them! The pillows help to support your growing belly and may provide some back support as well. If you’re not a fan or don’t have space for one of these monstrosities you can make a body pillow work. I’ve been using a rolled up towel under mine for now but will definitely be trying the pillow route again soon. Your belly will stretch a lot during pregnancy, which can result in the dreaded stretch marks. While the experts say that whether or not you develop stretch marks is mostly genetic, giving your belly some extra love can’t hurt. Many people told me this was the best stuff to help prevent them. I did not get stretch marks on my belly during pregnancy. Whether it was because I slathered it in Burt’s Bees Mama Butter or not, it certainly helped my stretching skin to stay soft. Take a few minutes out of your day to give your bump some love! Your growing belly can also cause sore muscles in your back and legs. Some women also have issues with sciatica pain in pregnancy. A belly support band can help to ease some of that stress on your body. These are some top choices from other moms. You can also check with your OBGYN as they may be able to supply one in some cases. One of the things I miss most during pregnancy is a dip in the hot tub. Since a dip in a hot tub or an extra hot bath are off limits during pregnancy a heating pad can be the next best thing for sore muscles. Heating pads heat an isolated area with raising your overall core temperature so they are generally considered safe to use. For a sore neck take a men’s tube sock, fill it with rice and tie the end. Then microwave it to get it warm. It contours perfectly to your neck offering some relief. Nausea can be tough, especially in the first trimester. Sea Bands and Tummy Drops can both help to fight the nausea. Keeping crackers with you at all times can also help to keep the sickness at bay. What’s your favorite pregnancy product? Get more great advice in my other posts in the 31 days of tips for moms to be series. Pregnancy support bands are so helpful! I didn’t use one until my third pregnancy and it was incredible. I also loved the tanks that were built with extra support in them too. I never got a pregnancy pillow but wish I had. Even now, while not pregnant I tend to sleep with blankets between my legs. It’s so much more comfortable. The belly support band was a life saver!! My back hurt so much haha.